I worked at ASCII, the publisher. It was being developed externally by Visual Concepts on the SNES and PC. I was their producer. I was also the project leader on the Sega port done in house. There were a number of titles I worked on that got cancelled when ASCII imploded (ran out of cash) and fired everybody. Visual Concepts bought the rights back and published the PC version, possibly a Sega version. The SNES version stopped making progress well before the implosion though. Visual Concepts also became a Sega studio. That's probably why a SNES version was never published. Dominus was shown at the Winter 1993 CES. 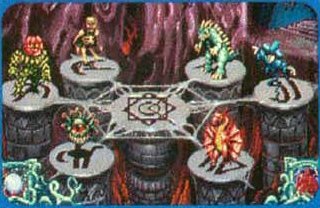 Nintendo Power states that it allowed you to control up to 500 different monsters.